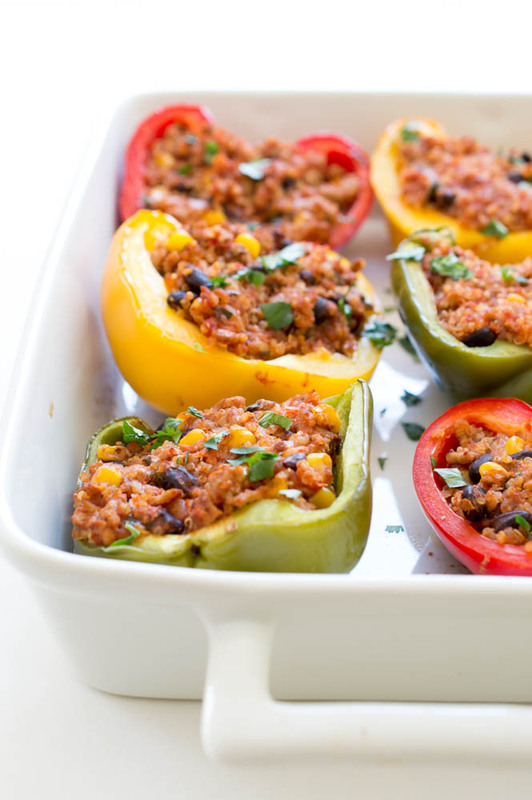 Healthy Mexican Quinoa and Turkey Stuffed Peppers. A quick, easy and healthy weeknight meal! 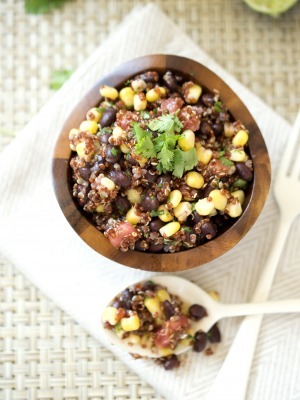 I love replacing pasta or rice with quinoa in some my favorite dishes. It’s loaded with tons of health benefits and is gluten free. Just as easy to prepare as rice but comes with a lot more health benefits. 1 cup of quiona has 8 grams of protein! To speed up this recipe I used pre-cooked quinoa. I like to make large batches of quinoa at the beginning of the week to toss into salads. 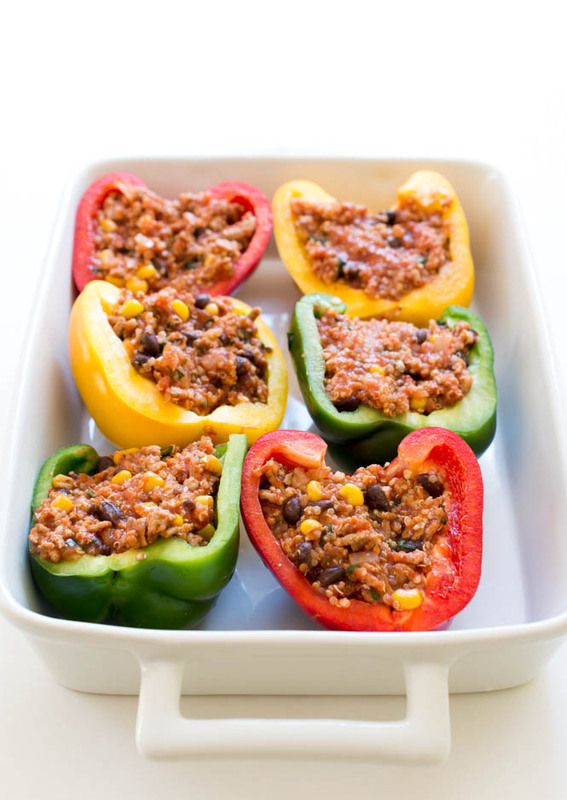 The stuffed peppers are loaded with lean ground turkey, black beans, corn, crushed tomatoes and quinoa. Cumin, cayenne pepper and paprika give the filling a little kick. This gluten-free dish takes 35 minutes to make start to finish. Not to shabby for an easy weeknight dinner. You could add some Mexican shredded cheese on top if you’d like. I wanted to keep this dish as light as possible so I omitted it. 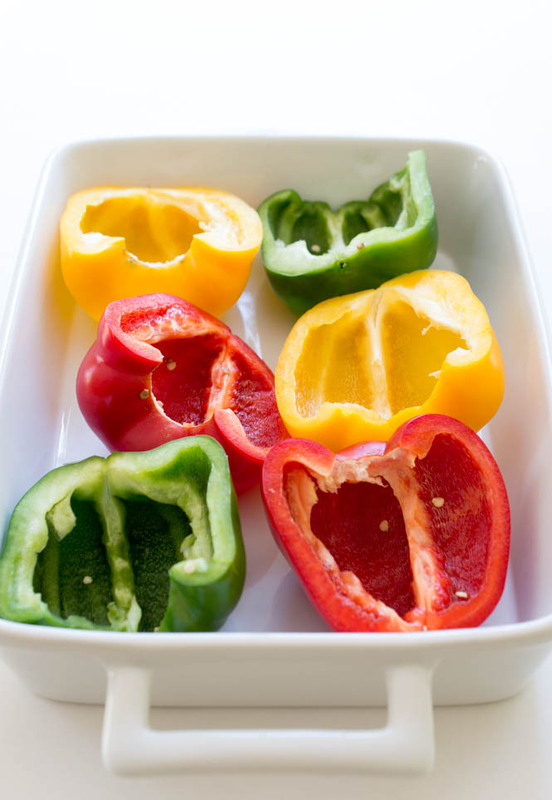 You can leave your pepper whole or cut in half lengthwise. I find cutting the pepper in half makes for an easier and less messy eat. I love how colorful these peppers are. Any color or type of pepper will do. I love the presentation of the tri-color peppers. Healthy, satisfying and loaded with flavor. 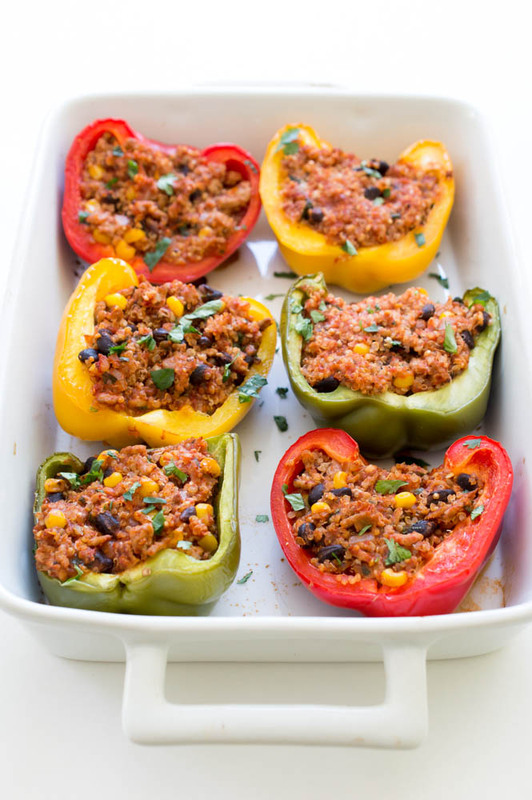 The stuffed peppers are cooked in the oven until perfectly tender. A filling, hearty and flavorful meal. Serve the peppers as is or with a side of enchilada sauce. Before serving top with extra cilantro for garnish if desired. Add in ground turkey and saute until fully cooked, 4-5 minutes. Add in onion and cook for 2-3 minutes. Toss in garlic and cook for an additional minute. Stir in tomatoes, chicken broth, corn, beans, cumin, chili powder, paprika, pepper and salt. Bring to a simmer. Cook for 2-3 minutes until slightly thickened. Take off the heat and stir in cooked quinoa, lime juice and cilantro. Stuff peppers with the filling and place in a 9 x 13 pan. Cover with aluminum foil. Bake for 20-25 or until the peppers are tender and the filling is hot. This sounds great Kelley! We keep cooked quinoa in the fridge too, so this would be so easy to pull together on a weeknight. Thanks for sharing! Taste the rainbow! I love how quick and easy these are and you can just tell that they’re packed with flavor! 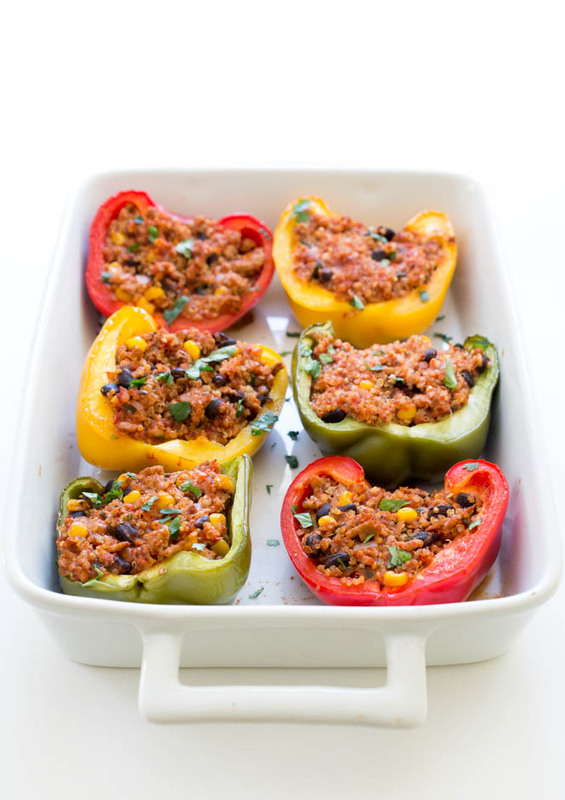 I love the idea of stuffing peppers with quinoa and turkey! This dish looks amazing, Kelley! Love the mexican flavors, too! Stuffed peppers are a summer favorite of mine when I’m overrun with peppers from the garden. 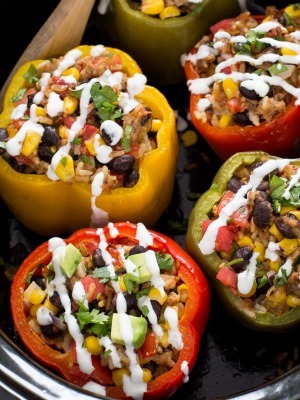 I love that you used quinoa and Mexican flavors! 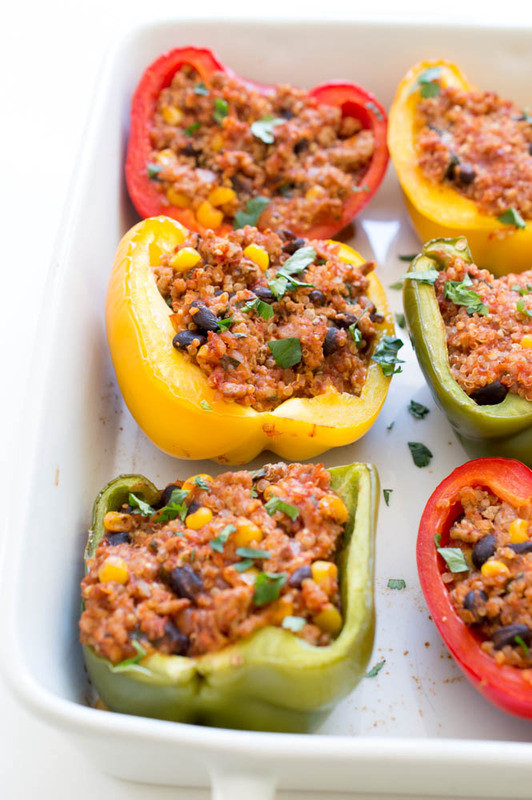 We love stuffed peppers in our house so these will be very popular! Thank you for the idea of replacing the rice with quinoa! Awesome! Looks great, but the beans and corn are missing from your recipe. Hi Loring, I am so sorry about that! I have fixed and updated it. Thank you for letting me know! Making this tonight! Thank you for the delightful recipe! It fits into my 21-DFX meal plan perfectly! Yah! 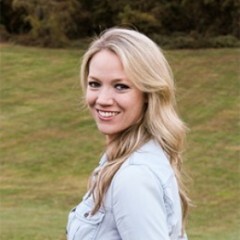 So happy to hear that Laura! Hope you enjoy! All things yes! I needed to add a lighter meal (carb heavy meals mostly to satiate my metabolism) that still was high in protein! Added to my grocery list and will review when done! Also, no cheese (lactose-intolerant)!!! Yum. Made a couple of modifications, but nothing too crazy. Also! I put my quinoa in the rice cooker (1 part quinoa 2 parts water) and it timed out pretty well. It was the 1st thing that I did. Also, for people who love to big batch things… I doubled it and put the leftover portions in a full seeded bell pepper. So now when I want to eat it, I chop it in half, i put it in the toaster oven (or microwave) and BAM! 1 person serving freshly cooked in a pepper. Yah so glad you enjoyed it Preston! This looks wonderful and I’m going to try it, among more of your recipes. However, I would appreciate your recipes including calories and other nutritional information. This is very important if we’re following a strict caloric diet and using MyFitnessPal or other systems to track our daily food/calorie intake. Delicious and so easy! I used a packet of quinoa and kale from Costco which made it even easier and also didn’t want to put the oven on so I cooked them in a deep pan with broth/water, covered for about 20 min. Definite keeper! I love LOVE this recipe!!! I have made it several times and it is always a hit!! I like to spice it up with fresh chopped jalapeños, but it’s an AWESOME recipe! These are AMAZING. Super simple. Super delicious. Healthy but packed with flavor. Literally nothing more I could ask for from a weeknight meal. My partner doesn’t eat beans or quinoa but eats these without a second thought. I made extra filling and it’s going to make a killer egg scramble tomorrow morning. I am so glad you both enjoyed this recipe so much.